As part of the ongoing transit analysis, The City of Elk Grove will hold two workshops tomorrow. 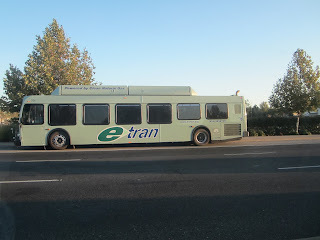 The Comprehensive Transit Analysis project began in fall 2015 and will be used to define the short-term and long-term transit needs in Elk Grove's e-Tran bus service including opportunities for transit service connections to Regional Transit’s light rail service. The analysis will be used to develop an action plan that guides transit service improvements over the next 5-10 years. The 90 minute workshops will be held at 2 p.m. and 6 p.m. Each session will include a short presentation followed by a question and answer session and opportunities to provide feedback on proposed service scenarios. Complimentary refreshments will be served. I think Elk Grove is big enough now to start e-Plane, a commuter airline run by the city to shuttle commuters back and forth, and to help lure the Silicon Valley firms and executives we are seeking. I think the city should buy some more land out by the soccer field to build a runway and small terminal. Call it Elk Grove regional airport and paint little elk faces on the nose of the aircraft. They could just annex the existing airport. Mayor Ly can probably leverage his celebrity to get the tourists in.